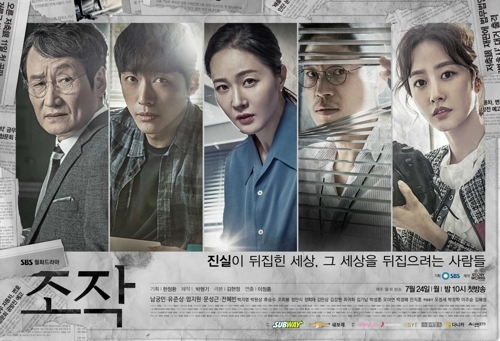 SEOUL, Aug. 9 (Yonhap) — SBS TV’s “Distorted” led the Monday-Tuesday late night drama race, while rivals shows lagged behind with single-digit ratings, according to data Wednesday. Episodes 12 and 11 of “Distorted,” which aired Tuesday evening, recorded 11.4 percent and 10.1 percent viewership, respectively, according to Nielsen Korea. In “Distorted,” actor Namkoong Min plays a tabloid journalist named Han Moo-young, who seeks fame utilizing questionable gonzo reporting tactics. He does anything and everything for a scoop, often times by injecting himself into a story. He later discovers an explosive conspiracy and ends up partnering with Kwon So-ra, a prosecutor played by Uhm Ji-won, to get to the bottom of the truth. MBC TV’s new period drama “The King Loves,” starring Im Si-wan and Yoona of Girls’ Generation, came in second, with episodes 16 and 15 recording 7.2 percent and 6.2 percent, respectively. KBS 2TV’s high school drama series “School 2017” finished last, with 4.7 percent.